I found myself speaking with a good friend today, one I hadn't seen in far too long. We'd started grad school in the same year, and in the same tiny Theatre department, so conversation naturally turned towards things we'd seen and things we hoped to see (in between jokes about Lope de Vega and Bleak House, of course). The conversation took a turn into a particularly relevant avenue- the expectations we place upon a production, and which in particular are the unfair burdens. He happened to love As You Like It dearly, and I confessed I'd never known why people held it in such high esteem. Every time I saw a production- and I've seen several now- I'd entered the theatre hoping to be won over. The longer I've held out and been unswayed, the greater burden of expectations falls on the next production. For example, I find the character of Jacques to be interminably tedious on the page, and so every time I see him walk onto a stage, I'm ultimately asking the actor to not just craft a thoughtful and well-tuned performance, but to change my mind. If he fails to perform that miracle and leaves me unsatisfied, whose fault is it? And how objective can my views truly be if I'm seeking miracles? Director Michael Attenborough's production of As You Like It at the Shakespeare Theatre Company does have its shining moments, ones that demanded my attention and grabbed for my heart. Attenborough is a frequent collaborator with his Rosalind, Zoë Waites, and her performance is a great justification for their partnership. Her presence onstage draws the eye and, more importantly, draws the audience in with her, carrying them into the heart of her dilemmas and heartaches and joys. Andrew Veenstra has an openness and charm onstage that works well in counterbalance to Rosalind's more internal struggles, and their scenes together are the strongest of the evening. 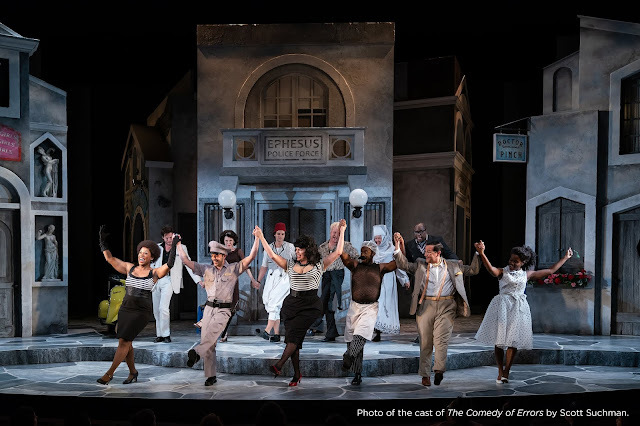 Adina Verson's Celia, at times, does seem to inhabit a different play than Waites, but it's hard to deny the genuine charm of Gregory Woodell's Oliver once he stumbles into the forest of Arden and into Celia's newly ready arms (oops, spoiler) . Sadly, I feel that the rest of the production lacks the charms of these pairs of lovers, despite talented actors trying their best (Andrew Weems in particular is up there trying his DARNDEST with the famously unfunny clown Touchstone). I had one great disagreement with this production: the set and costume design of Jonathan Fensom. I couldn't figure out how a play meant to have so much joy could look so bleak and washed out, and couldn't bear the curtains representing the various locales within the forest at all. I've been thrilled with productions on an emptier stage than this before, with even simpler costumes pulled out of actors' own closets. Why did I feel such a disconnect here? Thanks to a wonderful move by STC, the supplementary materials in their Asides magazine are now included in the playbill, and I soon found my answer in an article discussing Fensom's work: he joyfully described work he'd performed at the beautiful Globe Theatre in London, and remarked that his takeaway from that experience was the benefit of the empty stage and the paring down of scenic elements to those that inform the essence of the play. Reading those remarks, I can't help but think he's wound up with the wrong end of the stick entirely from his work at the Globe. There's a world of difference in pulling a beige curtain across a frons scaenae fretted with golden fire and fantastical portraits of gods and men, and pulling the same curtain across a cavernous brown and bleak stage. Shakespeare's stage was bare because the stage and the actors' costumes were dazzling. True blank slates are trickier to create than you might think, and too much drabness can weigh down imagination rather than serve as its launching point. There are lovely performances in this As You Like It, and it's intelligently presented. I wish it could have been more for me, that this might have been the production that let me see what so many others do in this play. For me, it wasn't, but I sincerely hope that it might be that production for someone else. I know of at least one acquaintance whose own life was transformed by seeing an As You Like It, so I look forward to the day when we can all say the same.